Our mystery squirrel is one of those strange creatures. Everything about it is counterintuitive. I remember being taught that the best way to tell the difference between fox and Eastern gray squirrels is that gray squirrel have white banding on their tails that makes them look gray. Fox squirrels– at least those in West Virginia and the northern and central parts of their range– tend to have orange-gold banding on the hairs of their tails. 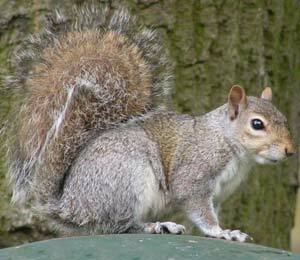 Their tails are usually much fuller than those of the gray squirrels, and they are usually at least 25 percent larger. Of course, all of that applies for normal phases of gray squirrel. Eastern gray squirrels are a bit like red foxes, American black bears, and gray wolves. Not all individuals are the color that their names would indicate. Eastern gray squirrels come in three distinct phases: normal gray, melanistic (black), and albino. I’ve seen variations on all of these colors. I have heard of normal grays with solid white tails, and I knew a very light-colored normal gray squirrel in Buckhannon, West Virginia. It was almost the color of a Siamese cat. It is not unusual for gray squirrels to have a red tinge to their coats. This is particularly true for melanistic individuals. (Another one here). Our mystery squirrel is one of these melanistic Eastern gray squirrels that has a lot of red coloration on its tail. Such squirrels are not incredibly common, but when one turns up, people think they are looking at fox squirrel or perhaps some new species that has not yet been documented. 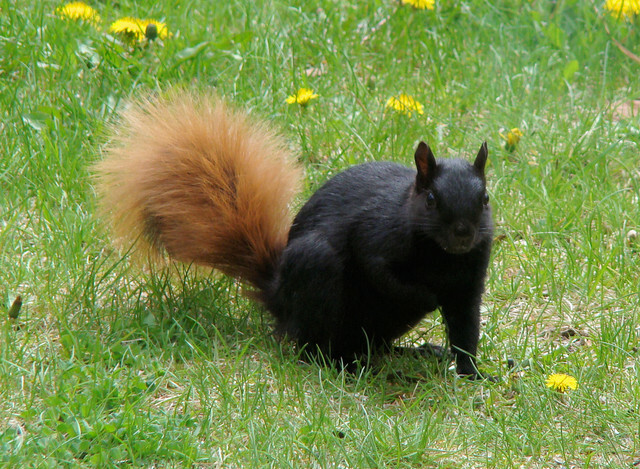 The first melanistic gray squirrel I ever saw had a red tail, and it looked very similar to this one. Most of the melanistic ones I’ve seen since have been solid black or had only a slight reddishness to them. It is certainly true that fox squirrels vary in coloration, and there are solid black fox squirrels (which is why their scientific name is Sciurus niger). 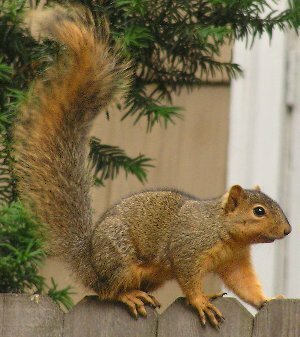 Where I live, it is nearly impossible to mistake a fox squirrel for a gray, because fox squirrels come in only the orange-tailed and agouti coloration. Gray squirrels are come in gray and black. The fact that the fox squirrels are so much larger means that it is so hard to mistake the two species. However, if you have just a photo of a squirrel with no size reference, the best way to tell them apart is look at their heads. Eastern grays are shorted headed. They have more delicate and “cuter” features than fox squirrels do. Of course, I’ve seen so many different fox and Eastern gray squirrels that I can tell them apart very easily. In the real world, the size difference alone is all one needs to tell them apart. In photos, just look at the head. 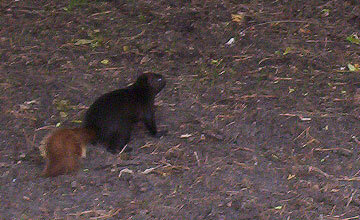 It is amazing how much these two very common squirrels vary in appearance. Gray squirrels are not always gray, just as black bears are not always black.